Looking for a beautiful cookie recipe that will make a great holiday gift? These are so good (and easy!) you just may not want to give them away! 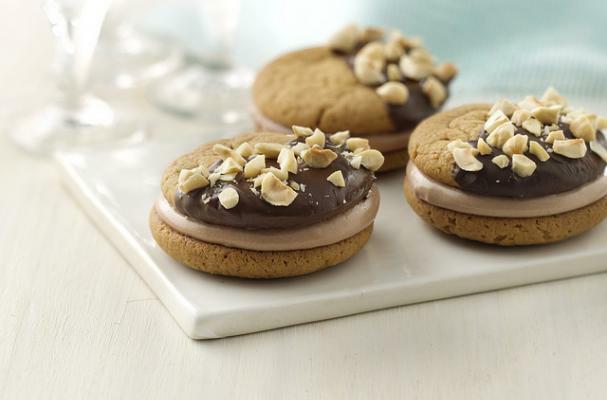 A creamy delicious hazelnut cream filling is nestled between chocolate dipped peanut butter cookies then sprinkled with hazelnuts for treat that can't be beat! This is one cookie recipe you'll want to double up on! Shape cookie dough into 24 balls. Place 2 inches apart on ungreased cookie sheets. Bake 9 to 14 minutes or until golden brown around edges. Cool 5 minutes; remove from cookie sheets to cooling racks. Cool completely, about 10 minutes. Dip or spread half of the tops of 12 of the cookies in melted chocolate. Place on cooking parchment paper. Top with chopped hazelnuts. Meanwhile, in medium bowl, beat mascarpone cheese and hazelnut spread until smooth. In second bowl, beat cream with electric mixer on high speed until soft peaks form. Beat in powdered sugar and vanilla until stiff peaks form. Fold whipped cream mixture into mascarpone mixture just until combined. Spread mascarpone mixture on bottoms of the 12 undipped cookies. Top with chocolate-dipped cookies to make sandwiches. Store in refrigerator until ready to serve. Variations: Omit the chopped hazelnuts and top with mini chocolate chips or chocolate sprinkles instead.